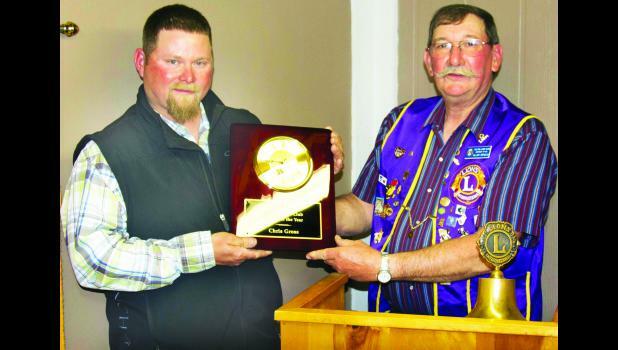 Chris Gross recently received the 2015 Farmer of the Year Award from the Holton Lions Club. Gross graduated from Holton High School and attended Benedictine College and Kansas State University. He grew up on a farm near Denison helping his dad from an early age. He was active in 4 H and FFA until he graduated from high school. He established the Chris Gross Construction Company in 2000, specializing in post-frame steel farm and residential buildings. Over the past 10 years, Gross has slowly been building his farming operation and currently farms 350 acres of row crop. With the death of his father in 2013, he also took over management of 250 acres owned by his mother. Of those acres, 180 are row crop. Livestock at the Gross family farm include horses, chickens, several barn cats and a family dog. He and his wife, Rachel, have been married for 11 years. They have three daughters, Macey, Tiah and Sadey, and one son, Thayne.